A.D. 2009 - The human race is in the middle of a three-way war with a race of giant humanoid aliens called the Zentraedi (male) and Meltrandi (female). After executing a space fold that sent it and part of South Atalia Island to the edge of the Solar System, the space fortress Macross is on its way back to Earth. 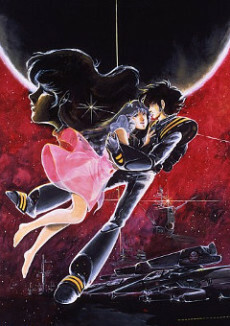 During a small skirmish with Zentraedi forces, young pilot Hikaru Ichijo rescues idol singer Lynn Minmay and their relationship develops as they're stranded somewhere within the ship. But shortly after returning to Macross City, Minmay is captured by the Zentraedi, and Hikaru and female officer Misa Hayase end up back on Earth - only to view the aftermath of the destruction of their civilization. Only a song discovered eons ago - along with Minmay's voice - can determine the outcome of the war.